Although we often situate cornbread within the pantheon of Southern foods (it was the runner-up in Garden and Gun’s Ultimate Southern Food Bracket this year, losing out to beignets in the end), the North has its own version too. Johnnycakes were passed down by the Algonquians, and became a recipe in most housewives’ regular rotation. “Every woman should be thoroughly learned in the art of cookery … Not only the fine bread, the cakes and pies, but the johnny cake should receive due attention,” a 1854 cookbook demands. I heartily agree; I rarely need to make fancy cakes, but I always find myself needing to make cornbread. Best to have a recipe on hand. 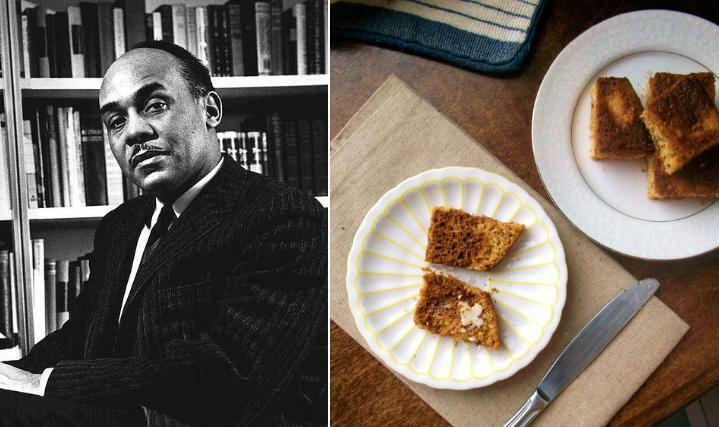 Cornbread was one of the first things Ellison learned to make at Tuskegee, and it became a fixture in his holy trinity of “righteous cuisine“: cornbread, buttermilk, and mustard greens. This cornbread is heavy on the buttermilk, along with some molasses that Ellison would serve in the dining hall, for a touch of sweetness. Eat it alone for breakfast, or make it into a meal with a side of braised greens. 1. Preheat oven to 425°F. Grease a 9-inch circular pan. In a large bowl, sift together corn meal, flour, baking powder, sugar and salt. 2. In a separate bowl, combine buttermilk, egg and butter. Add wet ingredients to dry ingredients, stirring until just combined. 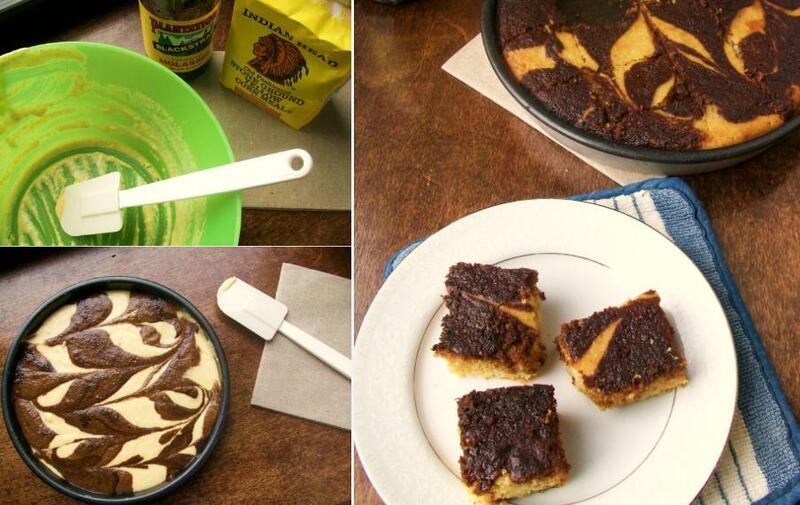 With a large measuring cup, reserve a quarter of the batter; pour remaining batter into prepared pan. 4. Bake 15 to 20 minutes, or until a tester inserted in the center comes out clean. Cool 10 minutes if you can wait – otherwise you will have crumbly cornbread on your hands. But there are worse fates than that. “cornbread, buttermilk and mustard greens. ” Wow. Do you have a recipe for buttermilk and mustard greens? I can’t imagine such a thing. Otherwise, you should probably put a comma after buttermilk. Depending on your age and nationality, you may not put that serial comma in the sentence. I’m in my mid-forties and was taught not to use them. Apparently the Brits do not use serial commas. It seems to have gained ground in recent years, however, and is now recommended, but I still don’t think it’s a hard and fast rule. Ooh, I love a good debate about a serial comma! I grew up using it, but have been trying to phase it out since it seemed like that’s the thing these days. I’m putting it in here, since it seems like it could be clearer. But I’m curious about how other people learned it! Thank you, Kate! Have to break in the new kitchen somehow. Such an interesting post! Food truly does act as an identity catalyst in so many novels, but I think you’re right in saying that the potato scene in “The Invisible Man” is one of the most recognisable. I’ll have to try the johnny cake soon. It’s definitely one of the scenes that sticks in my mind – but you’re right, there are so many great ones. What’s your go-to? There is a scene in a novel from the early 20th Century called “Bread Givers” by Anzia Yezierska in which the main character, who is a first generation Russian Jewish immigrant, becomes nostalgic about pickled herring on black bread-presumably a form of rye bread. She had been trying to distance herself from her family and past, but the food reminds her of her mother’s love and belief and encourages her to remain in contact with the rest of her family. It’s not a terribly well known novel, but food is quite important throughout, and the concept of self-expression through foodstuffs is interesting. I love how food does so much more than fill our bellies. Thank you for such a beautiful post. WHAT IS GOING ON. Am I really the only one who realizes what a blatant rip off this is of Yummy-Books.com? Everything from the concept to the blog theme to the font. Literally everything is the same. I’m sick over this. Shame on you, Paper and Salt! This is not your concept and you do not deserve credit! You stole this entire ordeal from someone else. Yikes, I don’t like this one bit. I think that you just could do with a few % to power the message home a little bit, but instead of that, that is magnificent blog. A fantastic read. I will certainly be back.